In simple terms, MTS/M2TS is HD video file format that is produced by HD camcorders. The file format is mainly used for storing HD videos on Blu-ray discs and AVCHD (Advanced Video Codec High Definition). Though camcorders from Sony, Panasonic and others come loaded with software that allows viewing videos from device to PC, but if you wish to enjoy or edit your video clips on Mac or other devices, you need to convert MTS/M2TS files to a popular and compatible format like MP4. So if you are looking for ways on how to convert MTS to MP4 on Mac, you are on the right page. Read below to know in details. The need to convert MTS/M2TS to MP4 arises due to many reasons. First and foremost, MTS is HD video format that is not compatible of playing over different media players and portable devices. So if you wish to play or share your recorded videos clips over an array of devices, you need to convert them to MP4 which is recognized by virtually all OS as well as players. Besides, MTS/M2TS files have high resolution and thus they are large in size. So if wish to clear some space on your Mac or device without compromising on video quality, converting MTS to MP4 is a great option. Thus if you convert M2TS to MP4 on Mac, you not only make your file compatible with different devices but also save space on your Mac. Using a professional, feature packed software is the best way to convert MTS/M2TS to MP4 on Mac. Wondershare UniConverter (originally Wondershare Video Converter Ultimate) for Mac will take care of this task in the most efficient manner. The software is easy-to-use, fast, and allows converting MTS to MP4 in addition to other formats with just a click. Wondershare UniConverter for Mac (originally Wondershare Video Converter Ultimate for Mac) is a complete conversion tool that supports more than 150 popular formats. Using the program, you can convert multiple files at a time at 30 times faster speed than other software. In addition to conversion, the MTS to MP4 converter also works as a great video downloader and recorder as it allows downloading videos from more than 10,000 sites including popular names like YouTube, Vimeo, DailyMotion, and others. 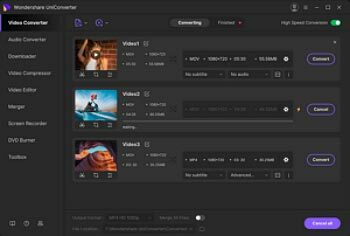 The software allows editing and personalizing your files with features like cropping, merging, trimming, adding watermarks and others. Burning, creating, editing, and converting DVD is also made possible using the software. Directly convert MTS, M2TS to MP4, VOB, AVI, MKV, MOV and other 1000 formats. Burn MTS, M2TS to DVD disk or Blu-ray disc to play with your DVD player. Transfer MTS, M2TS videos to iPhone, iPad and other devices directly. Supported OS: Mac OS 10.14 (Mojave), 10.13, 10.12, 10.11, 10.10, 10.9, 10.8, 10.7, 10.6, Windows 10/8/7/2003/XP/Vista. Step 1 Launch Best MTS to MP4 Converter on Mac and Add Files. 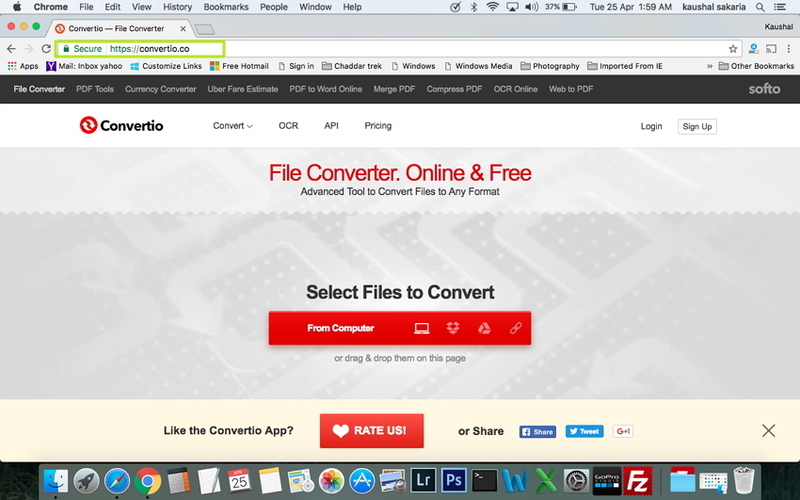 Download, install and then launch the converter on your Mac. Drag and drop the desired MTS file to the software interface. Alternatively, you can also click Add Files tab to add the files from your Mac system. At the top-right corner, click the inverted triangle to enter the Format panel, select MP4 and the related resolution under the Video category as the output format. Step 3 Convert MTS to MP4 on Mac. Finally, click Convert All button to start the conversion process. Before that, the location on your Mac where you wish to save the converted file can also be selected at the bottom of the main interface. The selected MTS file will be successfully converted to MP4 with above steps. Desktop software is definitely the best way for converting MTS files to MP4 format, but to enjoy complete features of the software, you need to pay for them. So if you are a little tight on budget and looking for a free alternative, then do not worry as there are many tools to your rescue. There are a few desktop software and a number of online converters that allow converting MTS to MP4 on Mac for free. 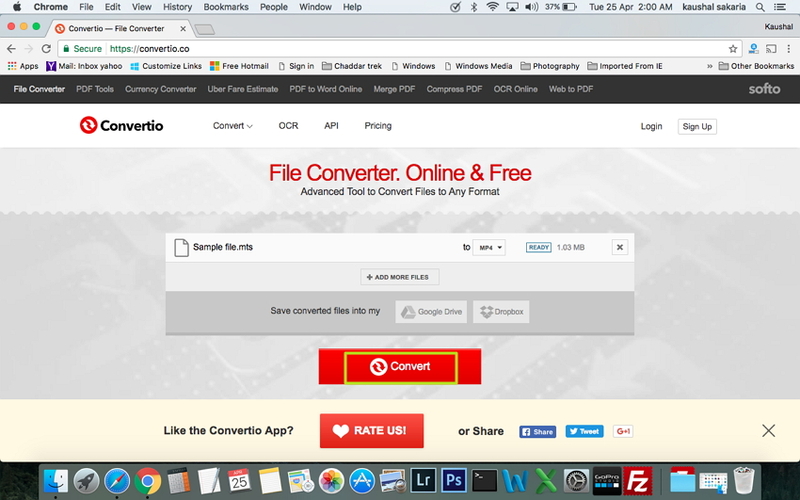 One such decent online converter is Convertio which is an free MTS to MP4 converter for Mac. The program is free to use and is available for Windows and Mac system. All popular video, audio, documents, images and archive formats are supported by the converter. 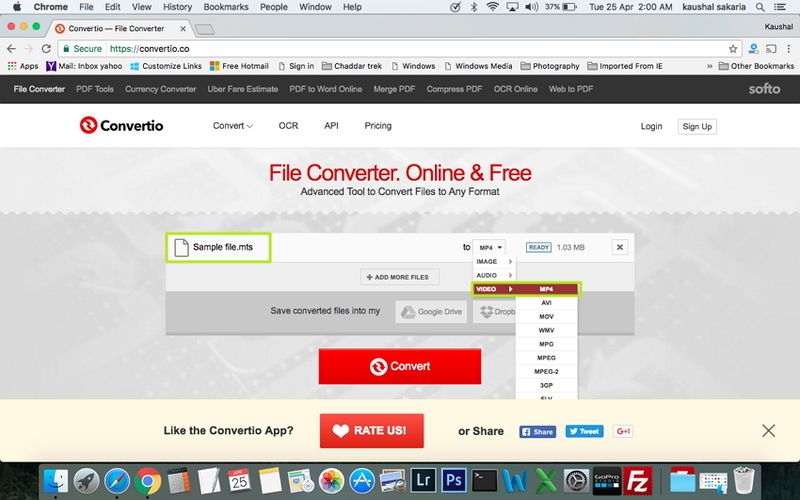 The converter allows adding files from multiple sources including local files, Dropbox, Google Drive, and URL. Once converted, the files can be either downloaded from the program or can also be saved directly to Google Drive or Dropbox. Step 1: Open https://convertio.co/ on your Mac browser. Step 2: Click Select File to Convert to add MTS file from your computer or other sources to the interface. Step 3: Once MTS file is added to the converter interface, select MP4 as the output format from Video category. Step 4: Click Convert to start the process. Once MTS file is converted to MP4, its download link will be made available. Above given are 2 feasible solutions for taking care of your MTS to MP4 conversion needs. Where on one hand, Wondershare UniConverter for Mac (originally Wondershare Video Converter Ultimate for Mac) is desktop software that is fast, reliable and packed with features, Convertio, on the other hand, is an online tool that is free to use with decent speed. So if you are still not sure which method to use, given below is a comparison table. Based on the table, you can assess your needs and requirements and select the best suitable option. So let's install Wondershare UniConverter for Mac (originally Wondershare Video Converter Ultimate for Mac) for hassle free and light the fast way to convert M2TS to MP4 on your Mac, then enjoy them watching on all portable players and devices.